(anon). 26 Type Brake Equipment for Locomotive. Wilmerding. Westinghouse Air Brake. nd. 4to. Soft cover. First edition. Illustrated. Folding plates. Fine copy. (anon). A Brief Survey of Railroads of Selected Industrial Countries. New York. Union Pacific. 1975. 4to. Soft cover. First edition. Fine copy. (anon). All Stations. A Journey Through 150 Years of Railway History. London. Thames and Hudson. 1981. 134 pps. Octavo. Hardcover. Reprint. Illustrated in color and black & white. Fine copy in fine dust jacket (in mylar). (anon). All Stations. A Journey Through 150 Years of Railway History. London. Thames and Hudson. 1981. 134 pps. Octavo. Hardcover. First edition. Illustrated in color and black & white. Fine copy in fine dust jacket (in mylar). (anon). All-Time Index. Railroad Magazine, Model Railroader, R.&L.H.S. Bulletin, Trains Magazine, Railroad Model Craftsman, Extra 2200 South, N.R.H.S. Bulletin. New York. Wayner Pub. 1978. 4to. Soft cover. First edition. Fine copy. (anon). American Railroad Journal. San Marino. Golden West Books. 1966. 120 pps. 4to. Hardcover. First edition. Illustrated. Fine copy. (anon). Art in Transit... Making it Happen. Washington. U.S. Dept. of Transportation. 1996. 40 pps. Octavo. Soft cover. First edition. Illustrated in color and black & white. Fine copy. (anon). Canadian Pacific Railway Company. Annual Report. np. Self published. 1960. 12 pps. Octavo. Soft cover. First edition. Very good copy. Non-circulating library stamps. (anon). Canadian Pacific Railway Company. Annual Report. np. Self published. 1959. 42 pps. Octavo. Soft cover. First edition. Illustrated. Very good copy. Non-circulating library stamps. (anon). 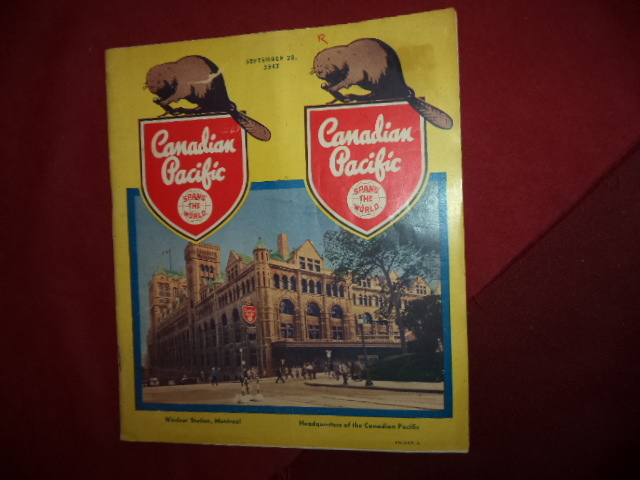 Canadian Pacific timetable. January 12, 1936. Photo available. Self published. 1936. 64 pps. Octavo. Soft cover. Illustrated. Maps. Near fine copy (very light shelf wear). (anon). 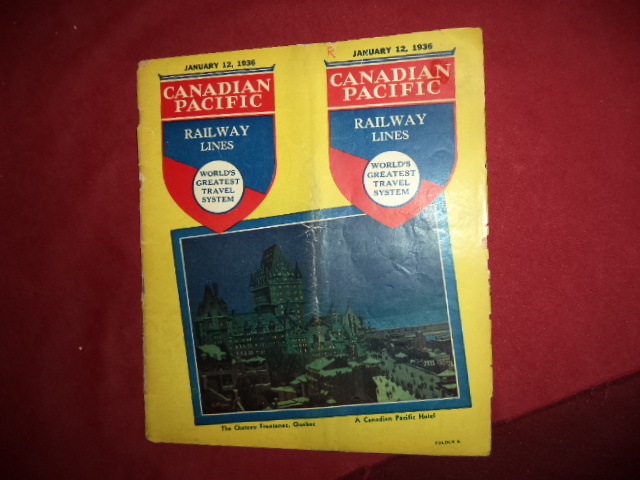 Canadian Pacific timetable. September 28, 1947. Photo available. Self published. 1947. 64 pps. Octavo. Soft cover. Illustrated. Maps. Near fine copy (very light shelf wear). (anon). Colorado Annual. 1963. The Silverton and "Rio Grande-Land". Golden. Colorado Railroad Museum. 1963. Octavo. Soft cover. First edition. Illustrated. Fine copy. (anon). Colorado Annual. 1964. To Silverton in Snow. Golden. Colorado Railroad Museum. 1964. Octavo. Soft cover. First edition. Illustrated. Fine copy. (anon). Electronics on the Rails. Sections 1 through 3. New York. Simmons-Boardman. 1979. 24 pps. 4to. Soft cover. First edition. Illustrated. Fine copy. (anon). Enchanting Horizons. Via Rail's Log to Western Canada. Quebec. VIA Rail. 1992. 98 pps. Octavo. Soft cover. First edition. Illustrated in color and black & white. Fine copy. (anon). Engineering and Contracting Procedure for Foundations. Comprising Bridge Foundations. Including Dames and Other Construction in Open Water. New York. ASCE. nd. 24 pps. Octavo. Soft cover. First edition. Fine copy. (anon). Fifty-Eighth Annual Report of Southern Railway Company. Year Ended December 31, 1951. Photo available. np. Self published. 1951. Octavo. Soft cover. First edition. Fine copy. (anon). Granite Rock Company. Photograph Album. Volume 39, Issue 431. np. Western Railroader. May, 1976. 8 pages. Octavo. Soft cover. First edition. Illustrated. Fine copy. (anon). Handbook of Aluminum Alloys. Montreal. Aluminum Company of Canada. 1944. 81 pps. Octavo. Hardcover. First edition. Illustrated. Fine copy. (anon). Henschel Lokomotiven. 125 Jahre. Dusseldorf. Rheinstahl. 1973. 4to. Soft cover. First edition. Illustrated. Fine copy. (anon). Instruction Leaflet No. 2391, Sup. 1. Repair Track Maintenance. Freight Brake Equipment "AB" Type. Wilmerding. Westinghouse Brake Co. 1978. 4to. Soft cover. First edition. Illustrated. Fine copy.